If you’re looking for an inspiration to lose weight, then it’s better to take the cue from the Bollywood stars who went from fat to fit by following specially designed weight loss diet and workout routine. Earlier, we’ve seen the success story of Sonakshi Sinha, and today, let us know about the Bollywood’s style icon, Sonam Kapoor’s journey from a chubby girl to fashion diva. She has acquired a fit body that made her the trend setter in the world of fashion. She is not the same Sonam Kapoor a few years back as she is now. Sonam used to weigh about 87 Kgs in her 20’s when she returned back to India from Singapore. Unfortunately, due to the lack of proper diet and exercise, she has put on a lot of weight while she was doing her acting course in Singapore. How Did Sonam Kapoor Lose Weight? 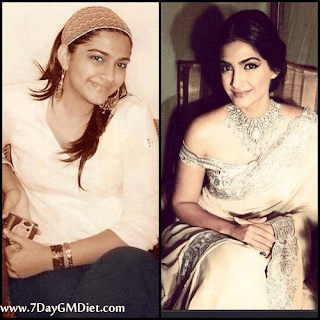 When Sonam was offered the role of the female lead in the film ‘Saawariya’ by Sanjay Leela Bansali, she decided to shed those extra pounds to fit the character and with the help from her mother and personal trainer, she kick-started her weight loss journey. She thanks her mother who always kept her away from sugary and fast foods. It is really a big goal to lose around 35 Kgs and to achieve that goal, Sonam Kapoor’s trainer has chalked out a plan that combines selected workouts and low calorie high protein diet. The workouts are planned in such a way that Sonam Kapoor has got a chance to practice Swimming, Power Yoga, Cardio and Kathak in order to get the right curves while shedding pounds. Sonam Kapoor has four personal trainers: Shervir and Monisha for weight training, Zarine Watson for general fitness, Bharat Thakur for power yoga and Yasmin Karachiwala for Pilates. Along with these workout routines, she also includes physical activities like Rugby, Basketball etc… as a part of her lifestyle. Sonam workouts, one part of her body each day and here is a sample fitness regimen of her. Jogging: She jogs everyday in the early morning hours. Yoga: Since stress is one of the reasons for weight gain, Sonam Kapoor does both yoga and meditation for at least 30 minutes every day. Cardiovascular Exercise: To burn more calories, including cardio workouts is the best option and so is preferred by Sonam too. She does cardio for at least 30 minutes. Swimming: Apart from burning calories, swimming also helps in developing the upper body and shoulder areas. Dance: If you want to tone your body without getting tired, then dancing is the best form. Squash: Sonam loves to play Squash twice a week as it helps in working out the overall body. Even though you’re practicing workouts regularly, your weight loss journey is always considered incomplete if you don’t follow a proper diet regimen. Sonam Kapoor considers eating smaller meals multiple times per day. She ensures to eat once every 2 hours to improve or maintain the metabolism. Whenever she feels hungry, Sonam munches on dry fruits, nuts, coconut water, buttermilk and cucumber juice. She always stays 100 kms far away from salt and sugar as they spoil her weight loss results. Below is a sample meal plan of Sonam Kapoor from the morning till night. Early Morning: Sonam starts her day with honey and lemon juice mixed in a glass of lukewarm water. Breakfast: Oatmeal (or) Egg omelet, brown bread toast, any 1 seasonal fruit and green tea without sugar. Along with these food choices, she also drinks adequate water. Morning Snack: Protein Shake and brown bread toast with 1 egg white. Lunch: 2 Rotis, Chicken (1 wing), vegetables, curd and any 1 seasonal fruit. Afternoon Snack: Egg white with brown bread toast. Dinner: Chicken sandwich, grilled fish and salad (fruits & veggies). After the meal, she drinks a glass of protein shake again and finishes the dinner part. Along with these foods, Sonam Kapoor always ensures to drink at least 2 glasses of water before every meal and insists on having her dinner at least 3 hours before going to bed. After seeing the weight loss journey of Sonam Kapoor, it is therefore to be noted that losing weight is not an easy task and also not an impossible thing. With proper diet and exercise, anyone can lose weight easily. Also, do remember that weight loss is 70% diet and 30% exercise, which include physical activities. Don’t go for short term weight loss diets, which may help you lose weight initially, but you’ll put on all that weight within a very short time. So, what’s your opinion about Sonam Kapoor’s weight loss journey from fat to fit and then to Bollywood’s fashion diva? Isn’t it inspiring? Do share your feedback in the comments below. Next Post:How to Do Oil Pulling for Oral Health & Weight Loss?